The new book from long time pilot and therapist Captain Tom Bunn, Soar: The Breakthrough Treatment for Fear of Flying, takes a unique approach when it comes to dealing with a fear of flying. In short, he brings the systematic and logical approach of an aviator to address anxieties and fears that make it difficult or impossible for some people to fly. Because of this systematic approach, Captain Bunn is able to explain the foundation for his methods for treating fear of flying in terms that make sense to the average passenger. With this book, Captain Bunn has provided both fearful flyers and other airline passengers with three distinct benefits. The first was his development of a conceptual model of how the mind experiences and deals with fear, and explaining it in terms that are understandable to someone who is not an expert in psychology or sociology. His second benefit was to explain the basics of airline operations in ways that demystifies the mechanics of flight and gives an average passenger a very clear idea of how pilots can calmly deal with situations that can lead to debilitating anxiety in a fearful flyer. Using his conceptual model of the mind as a foundation, Captain Bunn provided his third and most significant benefit for a fearful flyer by creating numerous resources and techniques that a passenger can use to overcome flying related fears, and showing how a person can systematically use his or her mind to consciously and unconsciously control fear. 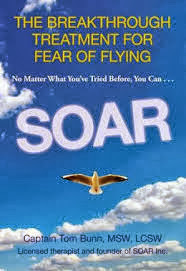 The basic SOAR approach is to first help a fearful flyer understand the basis of their fears and how their mind and body reacts to fear inducing stress, and then to show them how to automatically regulate and control their flight anxiety. The book, which is based on Captain Bunn's decades of experience helping thousands of fearful flyers, asks the reader to do two things, the intellectual task of reading the book, and the emotional task of working through numerous exercises that when completed will provide a fearful passenger with numerous tools and techniques to address their anxieties before, during, and after a flight. At first glance, it may seem that aviation and psychology don't have much in common, but Captain Bunn manages to combine elements of both worlds in his book. Like a pilot who has a combination of systems to fly a plane under normal and stressful conditions, so too does a human being have multiple systems to control emotions. As with an aircraft, there may be systems that run for the most part automatically or are used for routine situations, and others that come into play during stressful situations or when primary systems fail or are overwhelmed. So too with the mind, where an automated, unconsciously controlled system for dealing with fear is moderated by several other systems that can be consciously guided and controlled by any airline passenger. Just like the case with an airline pilot, having multiple sophisticated control systems at your fingertips won't give you any benefit unless you have a basic understanding of how they operate, and a good working knowledge of what procedures to use and when to use them. Just as a pilot doesn't have to become an aeronautical engineer to fly a plane, a fearful passenger does not have to become a psychologist to understand how to manage their emotions. Captain Bunn's greatest gift to the reader is the way that he has successfully combined a basic explanation of how the mind deals with fear with practical instructions for how to eliminate or manage that fear. If you are a passenger who has anxieties about flying and don't know how you can deal with it, reading this book would be a good first step toward overcoming your fear of flying.